Weekly favorites from the recently added patterns on Ravelry.com. 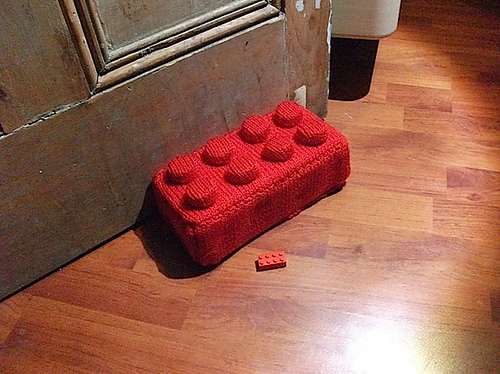 Giant LEGO brick!! Really, nothing more need be said. 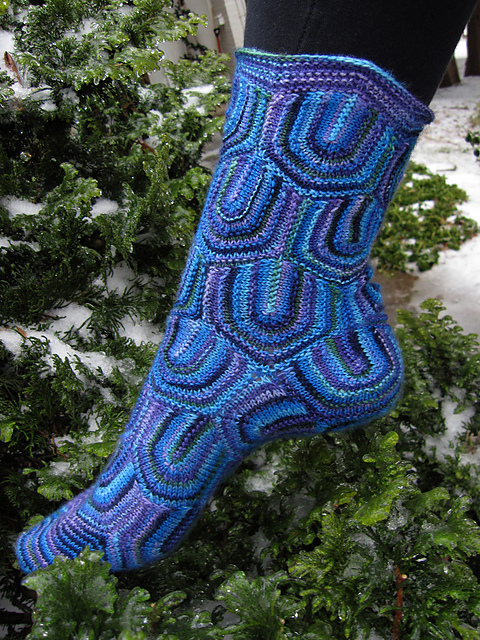 Practical, pretty, useful, and a stash-buster to boot — this pattern would use up all my favorite sock yarn odds and ends and lets me show them off too? Perfect. 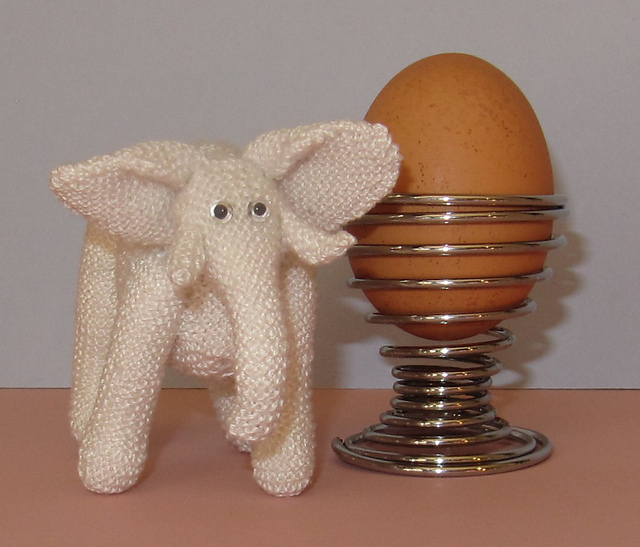 Made from pearl cotton, this teeny-tiny elephant is amazingly detailed. And yes, that is an egg. Wow. This balances the tiny LEGO brick made large nicely, don’t you think? What’s not to love about a Cthulhu scarf? This first-time designer has produced a clear, simple pattern that captures the horror that is the Great One’s tentacled madness. 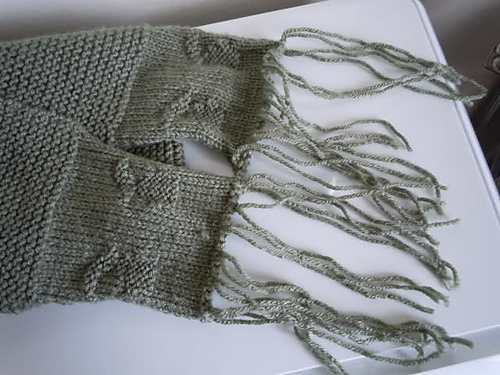 The scarf is mostly garter stitch, with Cthulhu’s face in washcloth-style knits and purls. Seriously, how OMG cool is this pattern? Perfect for all that gorgeous hand-painted sock yarn that tempts us sock knitters, then refuses to look pretty when we knit it up. 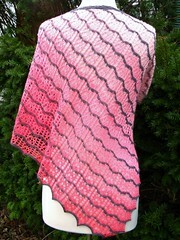 Entrelac meets short rows and beauty results. The designer re-assures us that despite the tiled effect, the foot and leg are knit in one piece — no interminable ends to weave in. This one is definitely a challenge … but sometimes isn’t that just what you want? This is a sweet little cardi with pretty details. It reminds me a bit of Titania, which is one of my favorite sweaters. I would knit it in some slinky cotton/silk/bamboo yarn and wear it all spring. What really, really gets me is this combination of robot-trendy purl ringlets, and Victorian-ish colorwork roses. Love it, times a million. Great, now I sound like the judges on American Idol!! I could see these looking great in a number of palettes … how about pinky roses with grey-green leaves on a rusty-brown background, and creamy rings? 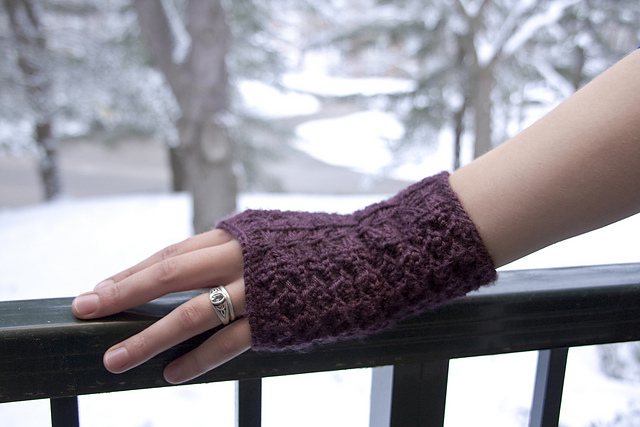 Really charming two-color mitts that look like they have a lot more going on than they do. I really love the clever increasing-diamond clocks on the thumb gussets. Clever! I would of course make them in deep purple and light teal blue. What is not to love? Simple, stylish, elegant … and in worsted, a crazy-fast knit. Is it too early to think Christmas?? 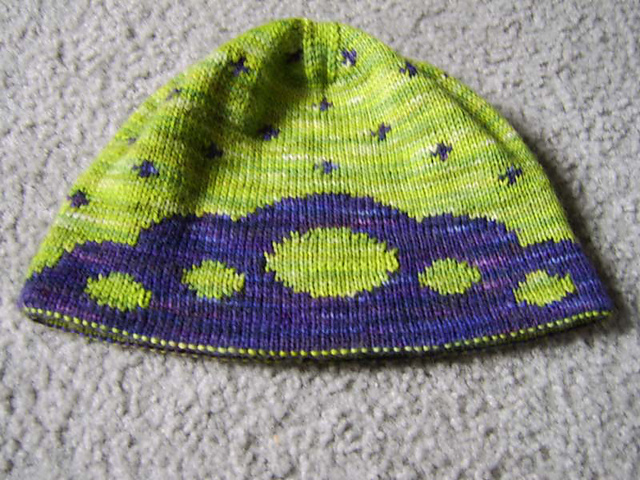 A couple versions of the hat have been released on Rav, but this is the one I like the best. 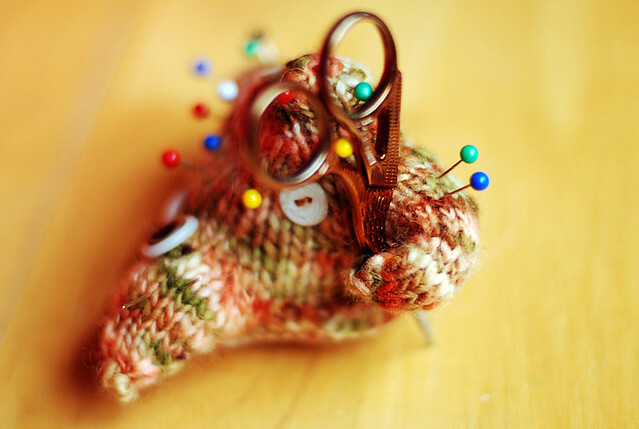 The designer captured the look and shape of the original, including a bang-up job on the yarn button. 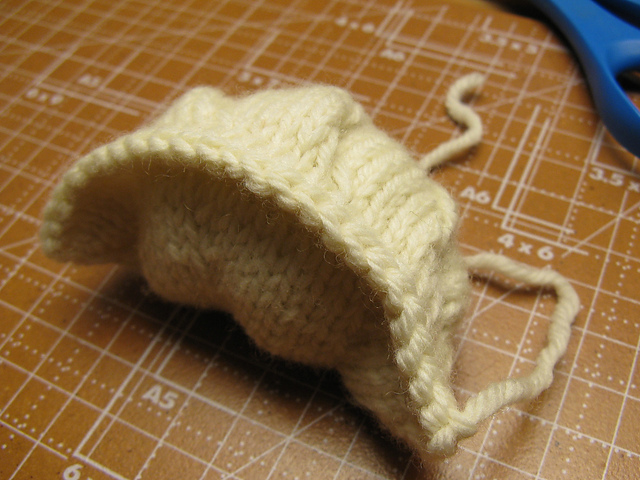 I predict cute little pixie hats covering the nation’s heads (well, at least the Gleek heads), especially since this pattern uses bulky yarn and should knit up exceptionally fast. I love knitting patterns that work with colorful yarn, mostly because a love colorful yarn and always want more. 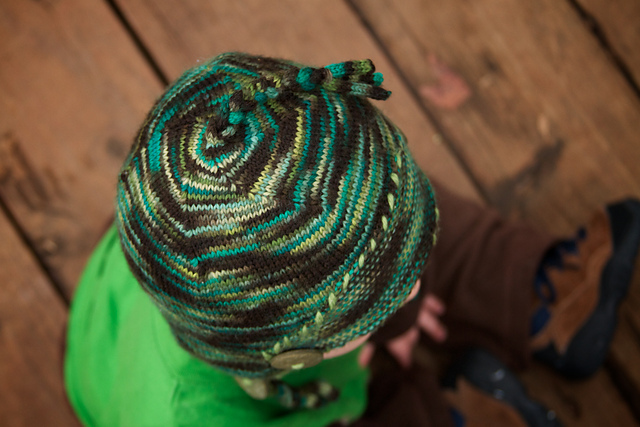 This hat has a nice shape and lots of cool details — tassles, buttons, braids, etc. 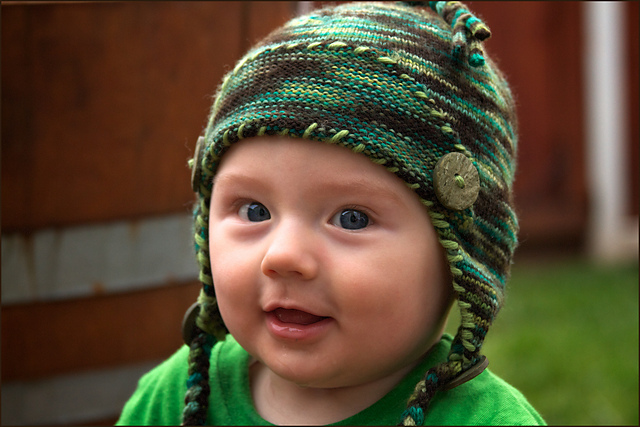 It also has a very, very cute baby model :). 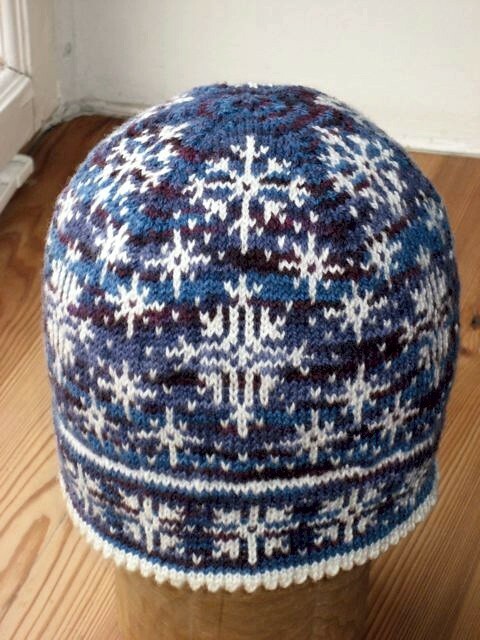 What a purty colorwork hat — cleverly placed snowflakes of different sizes and designs on a muted variegated background, yum! It looks like the pattern isn’t available quite yet, but it is a new listing, so with luck it will be up soon. 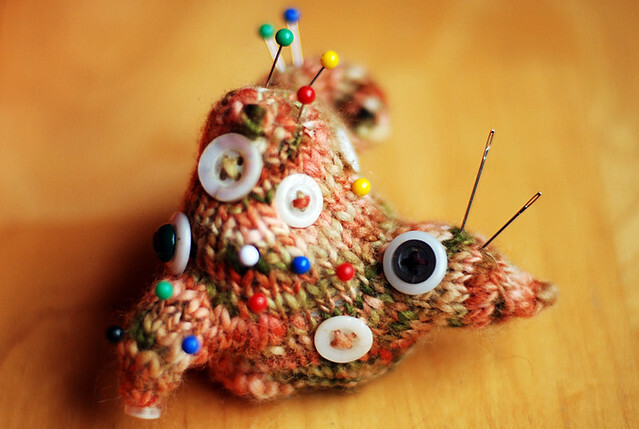 I’ve played enough Arkham Horror to know that a Shoggoth isn’t something you want to meet ever, let alone have in your home — but this mini Shoggoth-pincushion is welcome to take up residence on my knitting table. The designer captures the fluid asymmetry this particular monster should possess, while simultaneously making it cute. A great first amigurumi project — you can mess up a bit, and it would still be right! — and a perfect home for those odd buttons I’ve been saving up. This pattern makes clever use of the reversible nature of double-knitting to make a charming and warm beanie worthy of a princess. Although I love the popsicle colors of the sample hat, I think I might have to use golden yellow and princess pink — don’t you think? 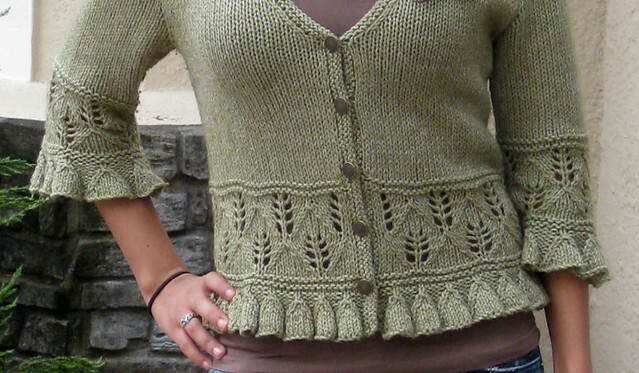 I’m intrigued by this drapey shrug… I’ve been wanting to make one of these “rectangle with sleeves items for a while, because they look so comfy and wonderful. I have put it off though, because it involves knitting a giant rectangle (just the kind of knitting I abhore). This pattern, with large needles and a silk/linen yarn, may be enough to put me over the edge. 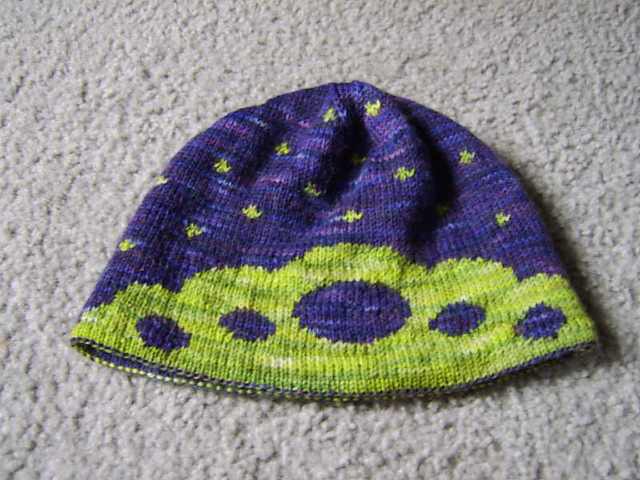 There isn’t any sizing on the pattern, which means I’d have to guess how much bigger to make it for myself. (I’m not really “tiny Japanese” shape, more like “European peasant stock.”) Still, it’s pretty and should knit up reasonably quickly. Pretty! 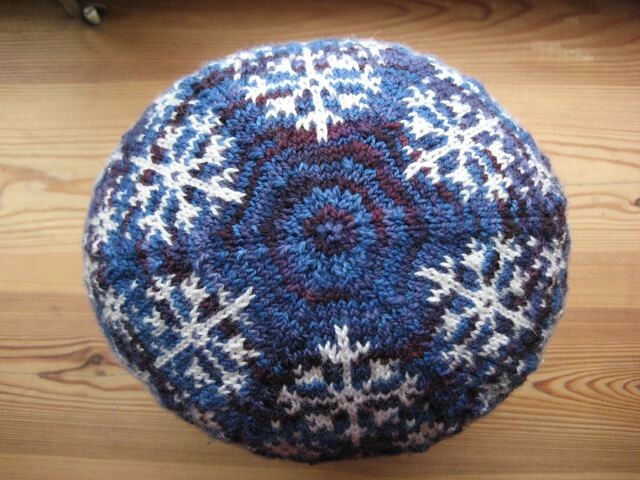 This hat is pure loveliness — beautiful swoopy leaves in an overlapping pattern that pleases me. 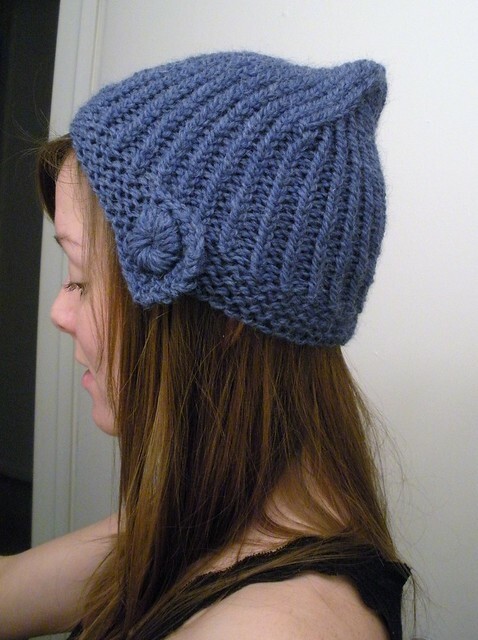 Slouchy hats keep me warm without crushing my hair, which puts them high on my “to-knit” list. Mmmmmm, Peking Ravioli! Pan-fried, please. 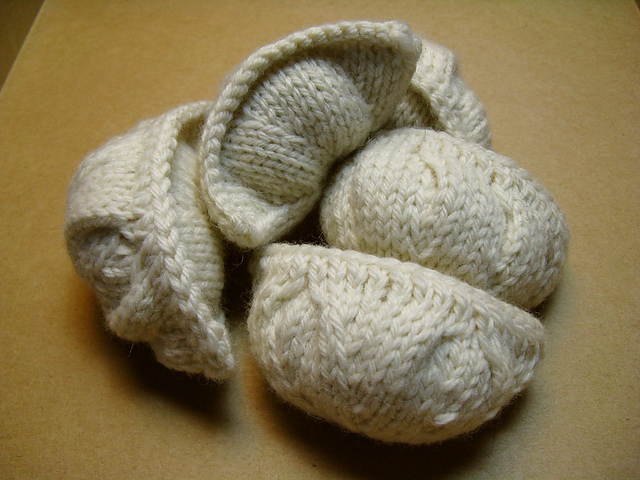 Cannot resist this knitted dumpling pattern. 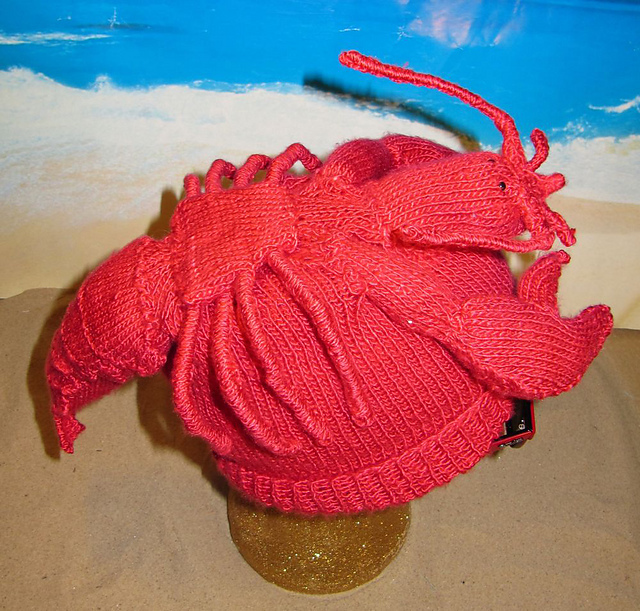 Since I am a New-Englander, I had to include this hat on my Ravelry Monday list. 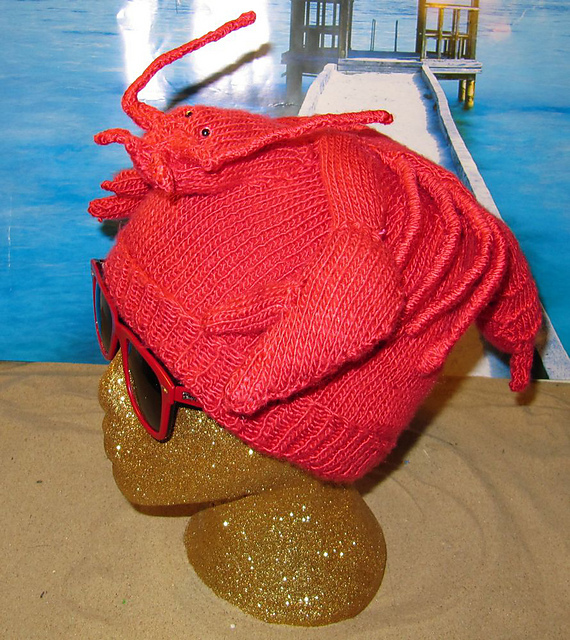 What’s not to love about a bright red beanie with a lobster on top?